Are you thinking about growing beans, including green, yellow, Lima, bush, runner and pole beans in your garden? Download our free plans for how to grow green beans in a small vegetable garden plot! Planting green beans in your vegetable garden is a simple and easy way to enjoy an abundance of this delicious vegetable! Also think about including some yellow wax, runner, or Lima beans in your vegetable garden layout. 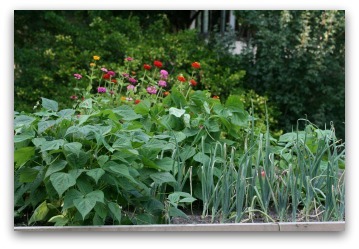 Beans can be grown in a traditional in-ground or raised bed vegetable garden. Either bush or pole varieties are available; it depends whether you want them to grow vertically, or take up a bit more space as small bushes on the ground. A few pole beans can be added to even a small vegetable garden, and can easily be grown by even a beginner gardener. Growing pole green beans or yellow wax beans can be as simple as making tee-pee of 6 foot gardening stakes placed in an 18 inch circle, and tied together at the top. The poles can be removed from the garden and cleaned at the end of the season, and re-used for several years. Baby Beans Sprouting in the Garden. Exciting Moment! Growing green beans is easy in a well-prepared garden plot. Many gardeners supply nitrogen to the plants with a nitrogen-fixing bacteria inoculation. If sufficient bacteria exist in the soil, treatments are generally unnecessary. 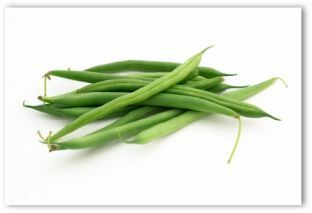 Recommended varieties of Green Beans are Blue Lake, or Kentucky Wonder in either the bush or pole variety. Lima bush beans are Fordhook 242, and Dixie Butterpea. For growing Lima pole beans varieties include Christmas, and King of the Garden. 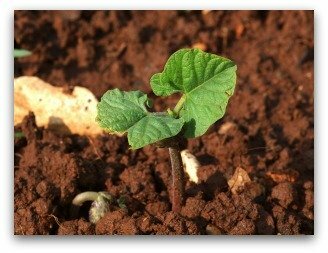 Most bean seeds germinate in an average 7-10 days. Keep soil moist during germination. Water frequently, as growing beans dislike drought. Days to harvest for most bean varieties, including green beans, are 65 to 75 days. Spacing between rows is 24-36 inches. Space between plants should be 3 to 4 inches at a depth of 1-2 inches. Plants needed per person are 10-20. Beans can be damaged by frost. Growing green beans like warm weather. Schedule plantings a few weeks after snap beans. Major pests of growing beans are caterpillars, mites, and beetles. Mulch to maintain soil moisture. Only a couple of complete analysis fertilizer feedings are needed. 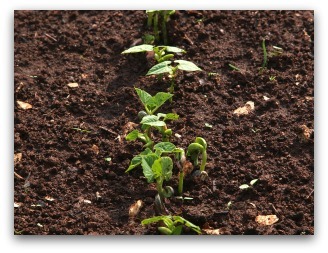 Beans get nitrogen from bacteria living in the soil. Plantings will need extra phosphorus and potassium during the 2nd and 5th weeks of growth. Use 2-12-12 or a similar product. If your bean bushes have plenty of flowers but no fruit, most likely, the growing bush beans are being fed too much nitrogen. Withhold fertilizer to encourage the fruit to grow. Extra feedings are needed while plants are producing if the foliage yellows or browns. Use a 5-10-10 or 2-12-12 analysis. Swelled balls attached to the roots of growing beans are produced by nitrogen fixing bacteria. The round growths can be easily pulled from the roots and most will remain in the soil when the plants are removed to make room for the next crop. Nematode damage also causes enlarged roots. The destructive results of nematodes cannot be separated without breaking the root apart. Harvest time for growing beans: pick fresh green and yellow wax beans when the pods are firm and slender. Don't wait until the small beans begin to grow inside the pod. Harvest Lima beans before the pods begin to yellow and when the seeds fill the pods. For dried Lima beans, gather pods when they have turned brown and you can hear the seeds rattle. Best varieties for growing bush snap beans are Contender, Harvester, and Cherokee Wax. Pole snap beans include Dade, Mccaslan, and Blue Lake. Seed germination takes place in 7-10 days. Days to harvest are 55-70. Space bush snap beans between rows at 18-30 inches. 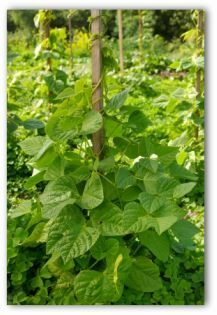 Grow pole beans on a tepee made with poles or strings radiating from a central post. Set poles or stake strings in the ground 1 to 2 feet apart. Plant 2-3 seeds at the base of each pole or string. Train vines up strings or poles. Seed germination is good, so plant seeds at desired final spacing. Very young plants can be carefully transplanted if they grow too close together. Water to keep soil consistently moist until seeds germinate, then water when soil begins to dry. Mulch to keep soil from splashing onto the crop of growing beans. Use additional fertilizer during the 2nd and 5th weeks of growth to supply plants with nitrogen. Snap beans are susceptible to bean leaf tearer, rust, rhizoctonia stem rot, and nematodes. At harvest time, pick when the seeds begin to swell in the pods. 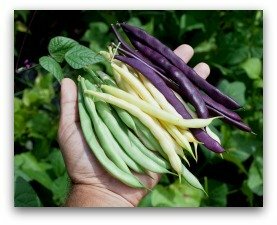 Small beans are very tender; gather growing beans before they become tough and stringy. Pick every few days to prolong production. Plant additional bean seeds every three weeks to prolong the harvest throughout the summer growing season. 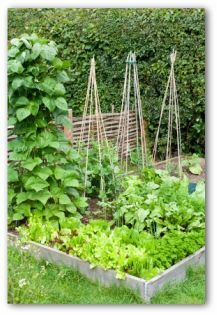 Several of our other free garden plans also include growing green beans. 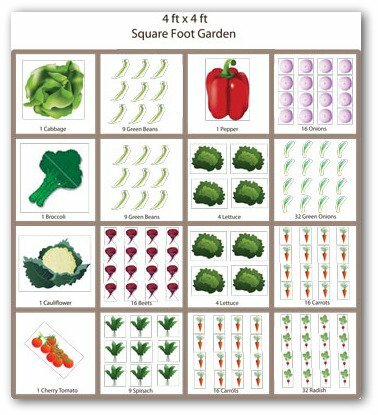 See our "free plans" page for additional garden plans that include planting beans. Green, yellow, bush, runner, pole or Lima beans make a great addition to any vegetable garden. Pole varieties can be trained to grow upwards on a trellis to take less space in your in-ground or container garden. Bush bean varieties will take a little more space, but don't need to be provided with poles or trellises to climb. Whichever you choose, you will be thrilled with the taste of tender fresh beans harvested from your vegetable garden.